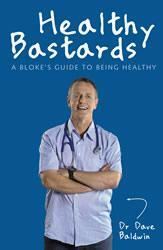 If itâ€™s true that laughter is the best medicine then Dr Dave Baldwinâ€™s â€˜Healthy Bastardsâ€™ is the essential prescription for every bloke who wants to know more about his health. Using his trademark humour and plain language, Doctor Dave takes the pain out of illness by explaining all common health problems and major diseases that affect the average Bloke. You'll also find out how different parts of the body work, and how to fix or avoid your particular complaint. Summaries and key points mean you don't even have read the whole chapter! A GP for more than 20 years, flying doctor Dave originally self-published this book for his pilot patients, and has now rewritten this accessible guide for the everyday Kiwi bloke.